Nervousness over North Korea and debt ceiling discussions in Washington sent stock indexes sliding on Tuesday to their largest single-day losses in three weeks. 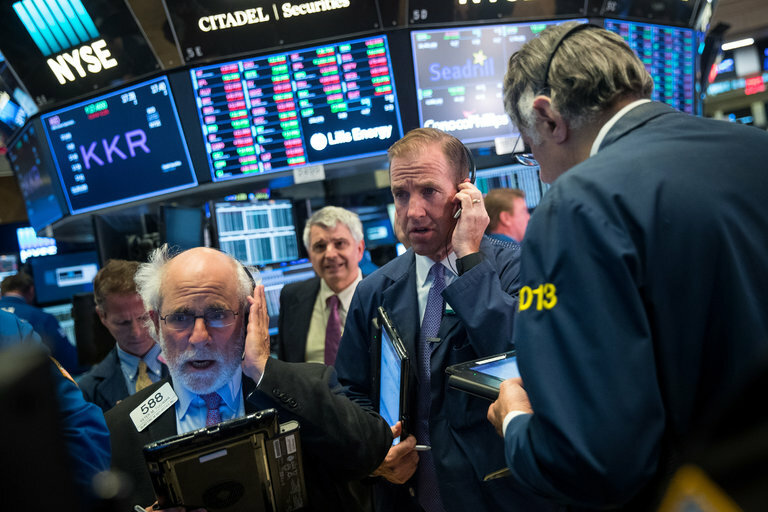 The Dow Jones industrial average tumbled 234.25 points, or 1.07 percent, to 21,753.31. The Standard & Poor’s 500-stock index lost 18.7 points, or 0.76 percent, to 2,457.85. The Nasdaq composite sank 59.76 points, or 0.93 percent, to 6,375.57. In Asia, the markets did not react as strongly, with only small dips. Each U.S. index had been on a multiday upward trend. The market close on Tuesday represented the steepest fall for each gauge since Aug. 17, when the markets were processing news of a terrorist attack in Barcelona and the dissolution of two of President Trump’s business advisory councils. The market is also wary of a potential fight in Congress over raising the debt limit. Treasury Secretary Steven Mnuchin has asked for an increase of statutory borrowing caps by Sept. 29, but his request is likely to be met with demands that the increase come with spending cuts or resistance to proposals that it be tied to a Hurricane Harvey aid package. But Bruce McCain, chief investment strategist at Key Private Bank, said he was not too concerned. If anything, the market swoon on Tuesday is evidence that all is well, Mr. McCain suggested. “Worrying about something relatively unlikely may indicate that the economy is doing pretty well because there’s nothing else there to worry about,” he said. Events like Mr. Trump’s decision to end the Deferred Action for Childhood Arrivals program have broad social implications but much less influence on investors, Mr. McCain said. Asian markets sank in morning trading on Wednesday but bounced back slightly later in the day. The Seoul KOSPI index deflated about 0.3 percent by the end of trading, while in Tokyo, the Nikkei 225 index fell 0.1 percent. The Hang Seng Index in Hong Kong ended the day down about 0.6 percent. In Germany on Tuesday, the DAX index had gained 21.5 points, or 0.18 percent, to 12,123.71. But in London, the FTSE 100 metric fell 38.55 points, or 0.52 percent, to 7,372.92. The 10-year benchmark Treasury yield dropped 8.7 basis points to 2.07 percent as investors sought haven assets. Benchmark United States crude gained $1.37, or 2.9 percent, to settle at $48.66 a barrel on the New York Mercantile Exchange. Brent crude, used to price international oils, rose $1.04, or 2 percent, to close at $53.38 a barrel in London.